The workmanship of the relief appears rather primitive, but the stela may have been left unfinished. The stela is divided into three registers. The upper register shows the Aten-sun disk with extending rays ending in small hands. The disk is placed between two mountains representing the horizon. On both sides stands a baboon, adoring the sun with raised arms. The middle register shows the sun bark with the falcon-headed god Re-Harakhty. To the right of the bark a man is kneeling, his arms raised in adoration; this must be the owner of the stela. To the left another upheld arm is visible, probably of his wife who is also in adoration. The lower register, which occupies the lower half of the stela, shows a man, a woman and two children in front of a well-provided offering table. 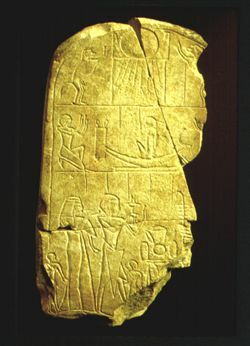 Most likely they represent the owner of the stela and his family. To the left of the offering table, a hand of the god who is being adored, holding a staff, can be seen. The staff is of a type that may belong to Khons or Ptah. The stela bears no inscriptions although the dividing lines of the text columns have been engraved.